Bangalore: For a person who does not believe in planning too far ahead, Ashish Gupta has come a long way. As managing director of Helion Venture Partners, a prominent venture capital (VC) firm, he has been taking huge bets since 2005 on entrepreneurs, their business ideas, their aggregate performance, and the Indian market for the next seven-eight years. “The goal is to become one of the top three VC firms in the country and not just by perception," says Gupta. “We would like to have returns and exits to substantiate our position." His office in the upmarket Embassy Golf Links business park in Domlur, Bangalore, is minimalist, the tone interrupted by a lone yellow coffee mug and photographs of his children. He was in a grey MakeMyTrip.com T-shirt. Gupta says his formula has been to “stumble" into his path—be it floating start-ups, joining a VC firm after a fellowship to understand the business, or returning to India to float one himself. “It’s a very exciting business here. This market keeps changing," he says. “People who walk in (entrepreneurs) are experts. It’s an endless treadmill." Over the past five years, Gupta has seen remarkable changes in Indian entrepreneurship. He has seen investors flock to India hoping to riding its rapid growth, only to realize that without infrastructure, it’s tough for start-ups to rise up the scale. “In 2006-07, investments were made on huge valuations. We were not seasoned investors. Now investors are realizing how long it will take a company to mature and generate revenues." It helps that promoters are more willing now to admit mistakes and refine business ideas. “Entrepreneurship attracts more seasoned executives now-a-days than straight-out-of-college enthusiasts." In an earlier avatar, Gupta co-founded two companies, angel invested in 35 firms, and worked at International Business Machines Corp. (IBM) and Oracle Corp. “I left those jobs. I realized there was something wrong with me and not the companies." 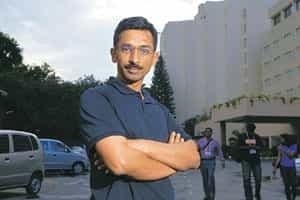 The PhD from Stanford University, California, and computer science graduate from the Indian Institute of Technology, Kanpur, then co-founded Junglee.com, a database technology firm in the US, only to sell it to Amazon.com two years later in 1998. In 2000, Gupta and his wife Nita Goel, whom he met at Stanford, and two others co-founded Tavant Technologies Inc. in the US. Venture capital at the time was on a roll in the US and Gupta applied for a Kauffman Fellows Programme to learn the business. Two years later, he joined the Woodside fund, an early stage VC firm in Silicon Valley. By then, the bug had got to him. “I seriously started thinking about starting a fund and left Woodside in 2004 and raised Helion in seven months," he says. In India, Helion has taken the lead in VCs turning more flexible in their approach to investments and dabbling in new sectors. It started as an early stage technology-focused firm, but today invests in both tech and non-tech companies. In 2009, all of Helion’s deals were in non-tech firms with a strong focus on domestic demand. “They have made this move this year and it’s commendable for any investor to be flexible enough to move away from their original thesis," says Mohanjit Jolly, executive director, Draper Fisher Jurvetson India, a Bangalore-based VC firm. To Gupta, Helion, too, is a start-up. A start-up that drew in the right people—Kanwaljit Singh, Rahul Chandra and Sanjeev Agarwal—and grew fast. While Singh and Chandra are friends-turned-partners, Agarwal is his sister’s husband. Without them, Gupta says he wouldn’t have started looking to raise capital. While Gupta would like his portfolio firms to grow as fast as Helion, he acknowledges making mistakes would be a part of the process. “We have agreed that we are running a business which is unknown and unpredictable," says Sourabh Jain, chief executive, JiGrahak, the first firm Helion invested in. “There is no operation interference. Helion teams offers only suggestions and guidance and it’s up to me take them or not." Draper Fisher’s Jolly says Gupta, because of his stint as an entrepreneur, is a promoter’s investor. “Entrepreneurs need someone grounded, not someone who lets success get into their head and become a self-centric, headstrong egoist. Gupta is a complete opposite."